To test a freewheel clutch simply turn the scooter or bike on and accelerate the throttle a little. 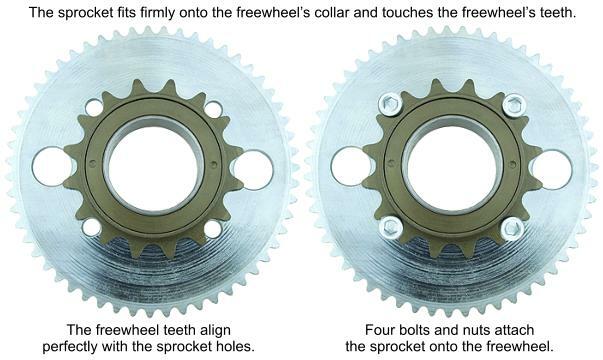 If the chain moves and the rear sprocket spins but the back wheel does not move then the freewheel clutch is defective. For tips on how to remove the old freewheel clutch please visit the freewheel clutch removal page. Right hand side freewheels are the most common type of freewheel and they are used on around 99% of electric scooters and bikes. If the chain is on your right hand side when sitting on the scooter or bike then the vehicle uses a right side freewheel. Electric scooter, dirt bike, and pocket bike freewheel clutch mechanism for right hand side chains. 4-hole. Freewheel engages in the clockwise directions. 3-1/16" OD x 1-5/16" ID. Works with 2-1/8" (54mm) ID chain sprockets with four bolt mounting pattern. Adjacent mounting bolt holes are spaced 47mm (1-3/8") apart from center to center. Fits 34mm (1-5/16") OD electric scooter, dirt bike, and pocket bike threaded wheel hubs. 34mm (1-5/16") ID. M35x1.00 right-hand threads. Electric scooter, dirt bike, and pocket bike freewheel clutch mechanism with for right hand side chains. 4-hole. 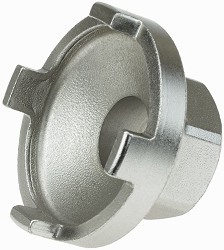 This freewheel has four notches for installation and removal with a freewheel tool (sold below). Freewheel engages in the clockwise directions. 3-1/16" OD x 1-5/16" ID. Works with 2-1/8" (54mm) ID chain sprockets with four bolt mounting pattern. Adjacent mounting bolt holes are spaced 47mm (1-3/8") apart from center to center. Fits 34mm (1-5/16") OD electric scooter, dirt bike, and pocket bike threaded wheel hubs. 34mm (1-5/16") ID. M35x1.00 right-hand threads. Electric scooter, dirt bike, and pocket bike freewheel clutch mechanism for right hand side chains. 16-tooth. Freewheel engages in the clockwise direction. 3-1/16" OD x 1-5/16" ID. Works with 2-1/8" (54mm) ID chain sprockets with four bolt mounting pattern. This freewheel has 16 teeth and also works with standard single speed 1/2"x1/8" (#410) bicycle chain. Fits 34mm (1-5/16") OD electric scooter, dirt bike, and pocket bike threaded wheel hubs. 34mm (1-5/16") ID. M35x1.00 right-hand threads. How does a sprocket attach to this freewheel? Electric bicycle freewheel clutch mechanism for right hand side chains. 16-tooth. Freewheel engages in the clockwise direction. 3-1/16" OD x 1-5/16" ID. Works with 2-1/8" (54mm) ID chain sprockets with four bolt mounting pattern. 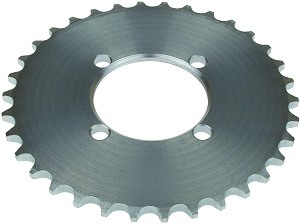 This freewheel has 16 teeth and also works with standard single speed 1/2"x1/8" (#410) bicycle chain. Fits 1-3/8" OD bicycle threaded wheel hubs. 1-5/16" ID. 1.375 x 24 TPI right-hand threads. Roller clutch sprocket with one-way bearing. Rotates freely in one direction; fixed in other direction. 14 tooth sprocket for 1/2"x1/8" (#410) bicycle chain. Fits 18mm threaded hub or shaft. Right hand clockwise threads. Sprocket OD: 62mm. Overall length of sprocket: 25mm. M18x1.00 right-hand threads. Left hand side freewheels are less commonly used than right hand freewheels. If the chain is on your left hand side when sitting on the scooter or bike then the vehicle uses a left side freewheel. Electric scooter, dirt bike, and pocket bike freewheel clutch mechanism for left hand side chains. 16-tooth. Freewheel engages in the counter clockwise directions. 3-1/16" OD x 1-5/16" ID. Works with 2-1/8" (54mm) ID chain sprockets with four bolt mounting pattern. This freewheel has 16 teeth and also works with standard single speed 1/2"x1/8" (#410) bicycle chain. Fits 35mm (1-3/8") OD electric scooter, dirt bike, and pocket bike threaded wheel hubs. 34mm (1-5/16") ID. M35x1.00 left-hand (counterclockwise) threads. Freewheel removal and installation tool for 4-notch freewheels. Works with freewheel item # FWM-120 sold above. This is a professional quality nickel plated forged steel tool. Stainless steel bolt and locknut hardware set used for attaching sprockets to freewheel clutches. 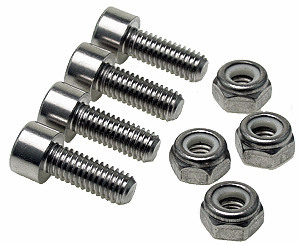 Includes four bolts and four locknuts. Sprocket dimensions 4-1/2" OD x 2-1/8" ID. Four bolt mounting pattern. Bolts directly onto freewheel clutches sold above. Sprocket dimensions 5-1/2" OD x 2-1/8" ID. Four bolt mounting pattern. Bolts directly onto freewheel clutches sold above. Sprocket dimensions 6-1/2" OD x 2-1/8" ID. Four bolt mounting pattern. Bolts directly onto four hole and 16 tooth rear wheel freewheel clutches sold above. 7-1/4" OD, 2-1/8" ID. 4 bolt mounting pattern. Bolts directly onto four hole and 16 tooth rear wheel freewheel clutches sold above. 95mm (4") OD, 54mm (2-1/8") ID. Four bolt mounting pattern. Bolts directly onto four hole and 16 tooth rear wheel freewheel clutches sold above. 4" OD, 2-1/8" ID. Four bolt mounting pattern. Bolts directly onto four hole and 16 tooth rear wheel freewheel clutches sold above. Sprocket dimensions 4-1/2" OD x 2-1/8" ID. Four bolt mounting pattern. Bolts directly onto four hole and 16 tooth rear wheel freewheel clutches sold above. Sprocket dimensions 5-1/2" OD x 2-1/8" ID. Four bolt mounting pattern. Bolts directly onto four hole and 16 tooth rear wheel freewheel clutches sold above. 161mm (6-5/16") OD, 54mm (2-1/8") ID. Four bolt mounting pattern. Bolts directly onto four hole and 16 tooth rear wheel freewheel clutches sold above. 5-5/8" OD, 2-1/8" ID. 4 bolt mounting pattern. Bolts directly onto four hole and 16 tooth rear wheel freewheel clutches sold above. 5-1/8" OD. Works with 5mm tooth pitch x 15mm wide HTD drive belts. Fit all four hole and 16 tooth freewheels sold on this page. Pre-assembled sprocket and freewheel clutch. 5-1/4" OD x 34mm (1-5/16") ID. Fits 35mm (1-3/8") OD electric scooter, dirt bike, and pocket bike threaded wheel wheel hubs. M35x1.00 threads. Right hand freewheel. We have a wide variety of freewheel clutches for electric; scooters, bicycles, dirt bikes, pocket bikes, chopper bikes, and go karts. Our freewheel selection includes left hand thread and right hand thread freewheels and freewheel mounting nuts and bolts. Freewheel clutches allow the rear wheel to spin freely without resistance from the motor when the vehicle is coasting, going downhill, or being pushed or pedaled. This increases the efficiency of the vehicle and gives it a longer range on a single charge of the battery pack. Freewheel clutches take a lot of abuse because the the entire power load of the motor is on them whenever the throttle is engaged so they are one of the parts that need frequent replacement.